Mary Jane Safford, born 31 December 1834, Hyde Park, Vermont; died 8 December 1891, Tarpon Springs, Florida. 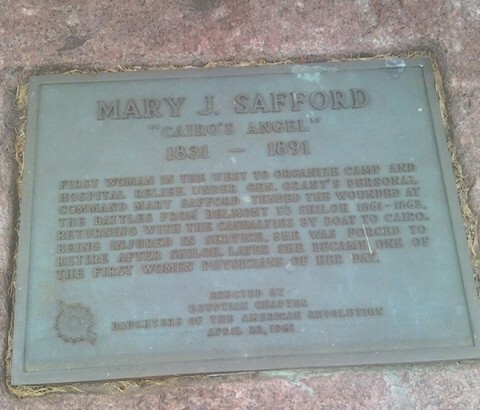 Miss Mary J. Safford, is a native of New England, having been born in Vermont, though her parents, very worthy people, early emigrated to the West, and settled in Northern Illinois, in which State she has since resided, making her home most of the time in Crete, Joliet, Shawneetown and Cairo; the last named place is her present home. 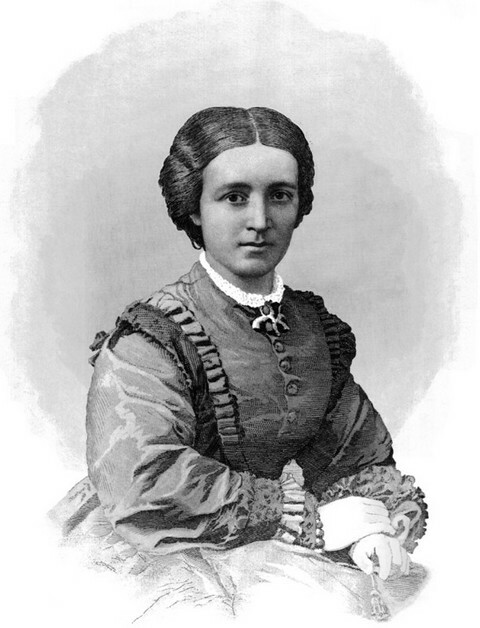 Miss Safford, early in life, evinced an unusual thirst for knowledge, and gave evidence of an intellect of a superior order; and, with an energy and zeal seldom known, she devoted every moment to the attainment of an education, the cultivation of her mind - and the gaining of such information as the means at hand afforded. Her love of the beautiful and good was at once marked, and every opportunity made use of to satisfy her desires in these directions. Her good deeds date from the days of her childhood, and the remarkably high sense of duty of which she is possessed, makes her continually in search of some object of charity upon which to exert her beneficence and kindly care. The commencement of the late rebellion, found her a resident of Cairo, Illinois, and immediately upon the arrival of the Union soldiers there, she set about organizing and establishing temporary hospitals throughout the different regiments, in order that the sick might have immediate and proper care and attention until better and more permanent arrangements could be effected. Every day found her a visitor and a laborer among these sick soldiers, scores of whom now bear fresh in their memories the petite form, and gentle and loving face of that good angel of mercy to whom they are indebted, through her kind and watchful care and nursing, for the lives they are now enjoying. The morning after the battle of Belmont, found her, - the only lady - early on the field, fearlessly penetrating far into the enemies' lines, with her handkerchief tied upon a little stick, and waving above her head as a flag of truce, - ministering to the wounded, which our army had been compelled to leave behind, to some extent - and many a Union soldier owes his life to her almost superhuman efforts on that occasion. She continued her labors with the wounded after their removal to the hospitals, supplying every want in her power, and giving words of comfort and cheer to every heart. As soon as the news of the terrible battle of Pittsburg Landing reached her, she gathered together a supply of lints and bandages, and provided herself with such stimulants and other supplies as might be required, not forgetting a good share of delicacies, and hastened to the scene of suffering and carnage, where she toiled incessantly day and night in her pilgrimage of love and mission of mercy for more than three weeks, and then only returned with a steamboat-load of the wounded on their way to the general hospitals. She continued her labors among the hospitals at Cairo and the neighborhood, constantly visiting from one to the other. Any day she could be seen on her errands of mercy passing along the streets with her little basket loaded with delicacies, or reading-matter, or accompanied with an attendant carrying ample supplies to those who had made known to her their desire for some favorite dish or relish. On Christmas day, 1861, there were some twenty-five regiments stationed at Cairo, and on that day she visited all the camps, and presented to every sick soldier some little useful present or token. The number of sad hearts that she made glad that day no one will ever know save He who knoweth all things. Her zeal and energy in this good work was so far in excess of her physical abilities, that she labored beyond her endurance, and her health finally became so much impaired that she was induced to leave the work and make a tour in Europe, where at this writing she still is, though an invalid. Her good deeds even followed her in her travels in a foreign land, and no sooner had the German States become involved in war, than she was called upon and consulted as to the establishment of hospital regulations and appointments there - and even urged to take charge of and establish and direct the whole system. "Miss Safford commenced her labors immediately, when Cairo was occupied. I think she was the very first woman who went into the camps and hospitals, in the country; I know she was in the West. There was no system, no organization, nothing to do with. She systematized everything in Cairo, furnished necessaries with her own means, or rather with her brother's, who is wealthy; went daily to the work, and though surgeons and authorities everywhere were opposed to her efforts, she disarmed all opposition by her sweetness and grace and beauty. She did just what she pleased. At Pittsburg Landing, where she was found in advance of other women, she was hailed by dying soldiers, who did not know her name, but had seen her at Cairo, as the 'Cairo Angel.' She came up with boat-load after boat-load of sick and wounded soldiers who were taken to hospitals at Cairo, Paducah, St. Louis, etc., cooking all the while for them, dressing wounds, singing to them, and praying with them. She did not undress on the way up from Pittsburg Landing, but worked incessantly. "She was very frail, as petite as a girl of twelve summers, and utterly unaccustomed to hardships. Sleeping in hospital tents, working on pestilential boats, giving up everything to this life, carrying the sorrows of the country, and the burdens of the soldier on her heart like personal griefs, with none of the aids in the work that came afterwards, she broke down at the end of the first eighteen months, and will never again be well. Her brother sent her immediately to Paris, where she underwent the severest treatment for the cure of the injury to the spine, occasioned by her life in the army and hospitals. The physicians subsequently prescribed travel, and she has been since that time in Europe. She is highly educated, speaks French and German as well as English, and some Italian. She is the most indomitable little creature living, heroic, uncomplaining, self-forgetful, and will yet 'die in harness.' When the war broke out in Italy, she was in Florence, and at Madame Mario's invitation, immediately went to work to assist the Italian ladies in preparing for the sick and wounded of their soldiers. In Norway, she was devising ways and means to assist poor girls to emigrate to America, where they had relatives - and so everywhere. She must be counted among those who have given up health, and ultimately life for the country." We add also the following extracts from a letter from Cairo, published in one of the Chicago papers, early in the war. "I cannot close this letter from Cairo without a passing word of one whose name is mentioned by thousands of our soldiers with gratitude and blessing. Miss Mary Safford is a resident of this town, whose life since the beginning of the war, has been devoted to the amelioration of the soldier's lot, and his comfort in the hospitals. She is a young lady, petite in figure, unpretending, but highly cultivated, by no means officious, and so wholly unconscious of her excellencies, and the great work she is achieving, that I fear this public allusion to her may pain her modest nature. Her sweet, young face, full of benevolence, pleasant voice, and winning manner instate her in every one's heart directly; and the more one sees her, the more he admires her great soul and her noble nature. Not a day elapses but she is found in the hospitals, unless indeed she is absent on an errand of mercy up the Tennessee, or to the hospitals in Kentucky. "Every sick and wounded soldier in Cairo knows and loves her; and as she enters the ward, every pale face brightens at her approach. As she passes along, she inquires of each one how he has passed the night, if he is well supplied with reading matter, and if there is anything she can do for him. All tell her their story frankly - the man old enough to be her father, and the boy of fifteen, who should be out of the army, and home with his mother. One thinks he would like a baked apple if the doctor will allow it - another a rice pudding, such as she can make - a third a tumbler of buttermilk - a fourth wishes nothing, is discouraged, thinks he shall die, and breaks down utterly, in tears, and him she soothes and encourages, till he resolves for her sake, to keep up a good heart, and hold on to life a little longer - a fifth wants her to write to his wife - a sixth is afraid to die, and with him, and for him, her devout spirit wrestles, till light shines through the dark valley - a seventh desires her to sit by him and read, and so on. Every request is attended to, be it ever so trivial, and when she goes again, if the doctor has sanctioned the gratification of the sick man's wish, the buttermilk, baked apple, rice pudding, etc., are carried along. Doctors, nurses, medical directors, and army officers, are all her true friends; and so judicious and trustworthy is she, that the Chicago Sanitary Commission have given her carte blanche to draw on their stores at Cairo for anything she may need in her errands of mercy. She is performing a noble work, and that too in the quietest and most unconscious manner. Said a sick soldier from the back woods, in the splendid hospital at Mound City, who was transferred thither from one of the miserable regimental hospitals at Cairo, 'I'm taken care of here a heap better than I was at Cairo; but I'd rather be there than here, for the sake of seeing that little gal that used to come in every day to see us. I tell you what, she's an angel, if there is any.' To this latter assertion we say amen! most heartily." Miss Safford is the sister of A. B. Safford, Esq., a well-known and highly respected banker at Cairo, Illinois, and of Hon. A. P. K. Safford of Nevada. L. P. Brockett and Mary C. Vaughan, Woman's Work in the Civil War: A RECORD OF HEROISM, PATRIOTISM AND PATIENCE, (Zeigler, McCurdy & Co., Philadelphia, 1867), pp. 357-361. 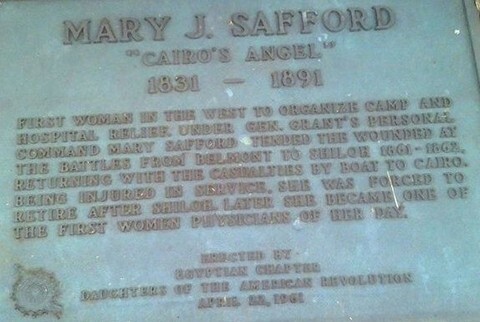 Leroy H. Fischer, Cairo's Civil War Angel, Mary Jane Safford. Boston University School of Medicine's Mary Jane Safford, M.D. (1834-1891). A historical marker in front of the Cairo Public Library. History of the New York Medical College and Hospital for Women.